Q: How to get call logs off a Samsung Galaxy S6 with a broken screen? "My Galaxy S6 turns on, but the screen is completely black and it won't do anything. I need to get text messages and call history off it for business reasons. Also I need to view my call logs to mark down some really important phone numbers and call them back. Please tell me there is a way I can do this! Thanks very much!" 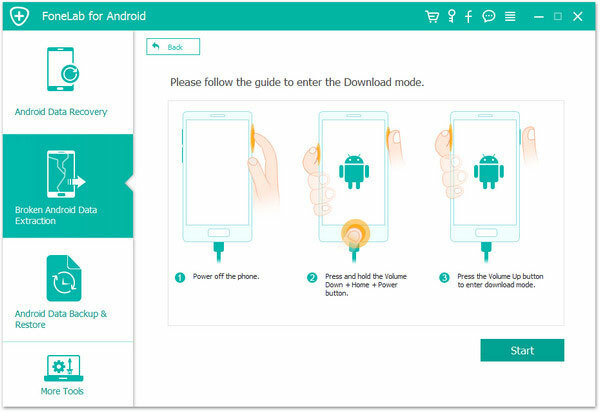 That how to access or recover data from an Android phone with broken/locked/cracked/black/dead screen is a frequently asked question, which has been troubling many users. 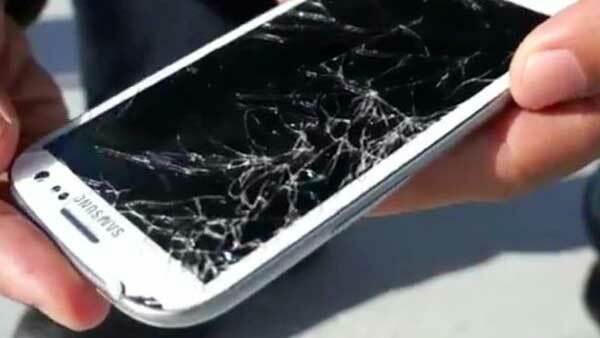 When your Samsung phone gets broken, you may not be able to operate your phone normally as usual. For example, the Touch screen is irresponsive when you tap on the screen, and even the phone screen gets black and seems dead. In that way, you can't check the call logs from Samsung phone with broken screen as usual. If you have the similar problem, please don't worry, you always have solutions to figure it out. You have two optional solutions: one is to contact your carrier and view your call history online, and the other is to recover the call history with a third-party data recovery software for broken Android devices. With the latter, you can restore not only call history but also text messages, contacts, photos, videos, audios, documents, WhatsApp data, WhatsApp attachments and many more from your broken Samsung phone or tablet. AT&T Wireless allows you to view call log online, but there are limits for different data plans. To check your call history on AT&T, you might refer to the following steps in general. > Sign into myAT&T with your User ID and password. If you don't have an account, you are required to create one with your personal information. > After that, please select "Call History" tab and search for the call records you need. Before going further, please be noted that with Verison Wireless, you can only view your international call logs while history of your local calls are not provided. > Sign in on My Verison with your User ID and password. If you don't have one, you might need to register a user ID at first. > When you have logged into My Verison, please click "Account" > "Bill" where you can check your international call history. To view call history online with the other carriers, such as Sprint, U.S. Cellular, T-mobile, please contact their service. If your carrier doesn't allow you to access the call history that you need, don't worry, there is an advanced way for you, i.e. recovering call history from broken Samsung phone with a data recovery software. You can have the user guide in the following part. To be honest, using a third-party data recovery tool is one of the most reliable solutions to restore call history from broken Samsung phone, especially with the professional Broken Android Data Extraction. This Broken Android Data Extraction program can help you retrieve call logs, contacts, text messages (SMS), message attachments, WhatsApp, WhatsApp attachments, photos, videos, audios, documents and more from broken or damaged Samsung phone, no matter they are stored in the external SD card or internal memory. What's more, this program won't modify or have your personal data leak out from your Samsung phone and it provides users with high efficiency in recovering call history from broken Samsung phone. Currently, this program only supports Samsung device in this mode, but it will be compatible with more Android phones soon. 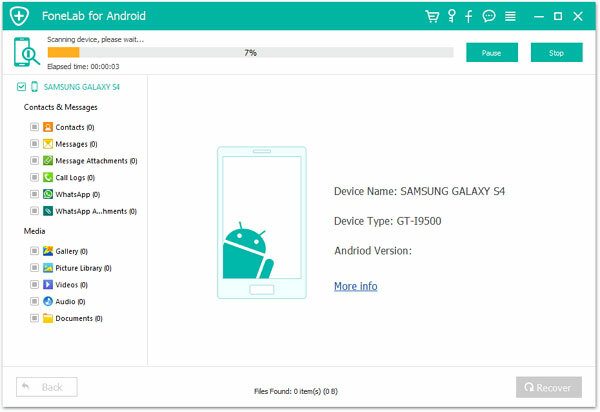 Now, please download the free trail of the Broken Android Data Extraction on your computer with the following download link at first, then refer to the instructions as below to recover call logs from broken Samsung phone or tablet. Here please be noted that if you want to recover contacts from broken Samsung phone with this program, you need to root your Samsung phone at first. Step 1. Launch the Broken Android Data Extraction program on your computer after downloading and installing. 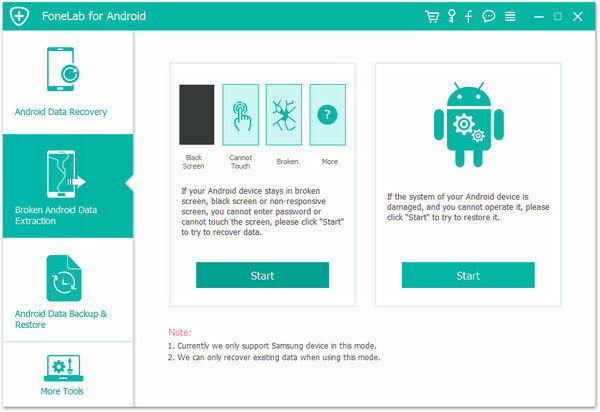 Then link your broken Samsung phone to computer with a USB cable, making the program detect it. Step 2. When the program recognizes your phone, please select "Broken Android Data Extraction" tab on the left panel. 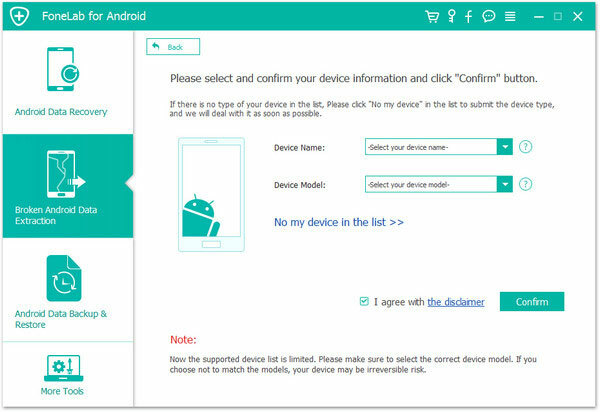 And select your device name and device model from the drop-down menu and click "Confirm" button to move on. Step 3. Then please follow the onscreen guide to put your device into Download mode and click "Start" button to access your device. Step 4. After that, the program will automatically scan your device for files. After a while, you might see all the recoverable file types on the left panel. Simply tick off "Call Logs" and other file types you want to restore, and click "Recover" button to start recovering call logs from your broken Samsung phone and store them on your computer in readable format. So easy, right? Why not have a try on this powerful data recovery for broken Android device and recover what you want from the broken Android phone?